Hi Shimmerz fans! 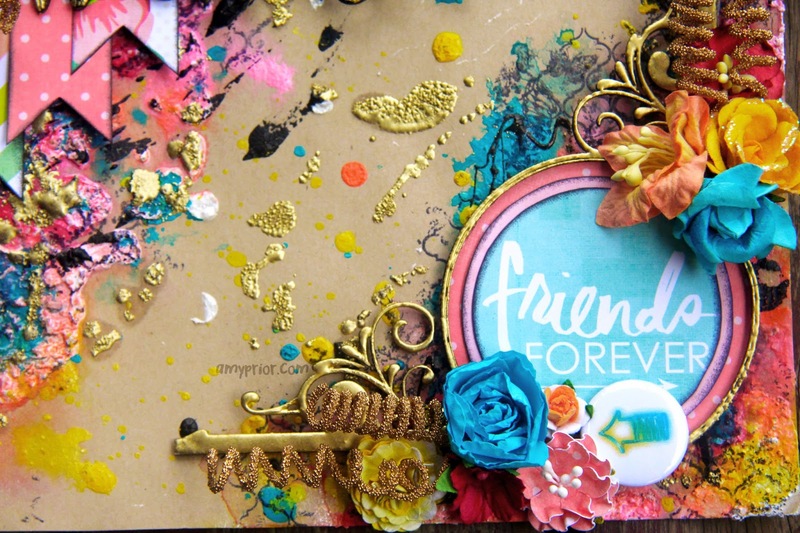 Amy Prior back with you all again today to share some more mixed media scrapbooking inspiration using gorgeous Shimmerz Paint Products. Don't forget that you can purchase your Shimmerz goodies direct from the manufacturer by visiting the Shimmerz retail shop here. Definately the best stock availability around. 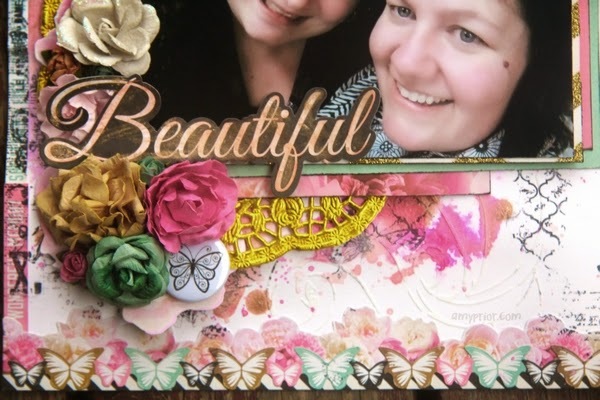 First up today I have a gorgeous and fun bright layout to share with you all that is mounted onto some Kraft cardstock. How fun is Kraft cardstock when you add bright colors am I right? I just adore Kraft and usually go through phases of being a bit kraft-karazy so you have been warned LOL. 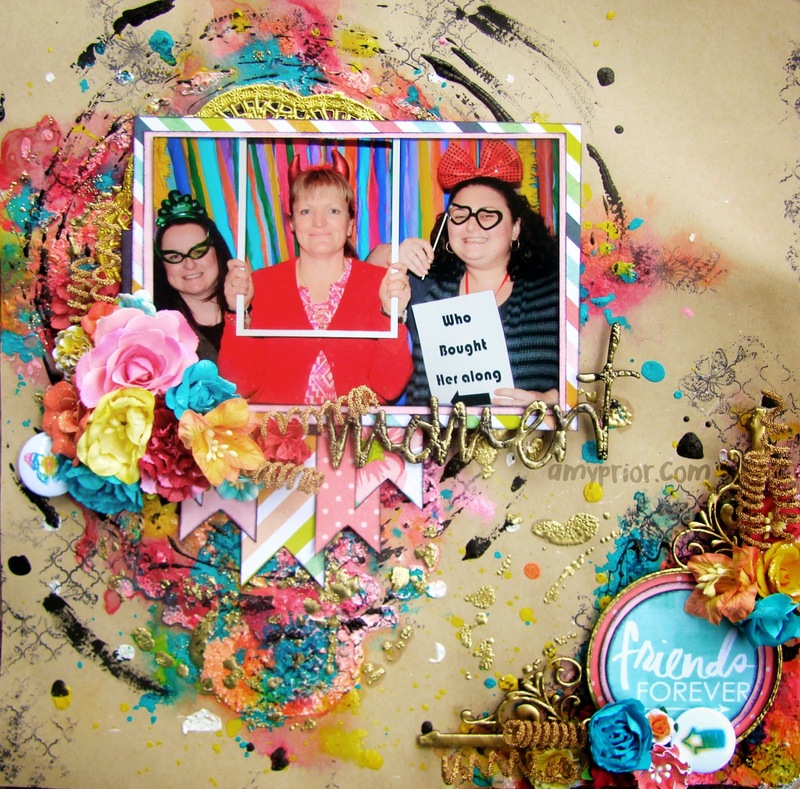 To create the background of this layout, I have first added some Shimmerz Texturez in Tidy Widy using a new Crafters Workshop Stencil called Altarpiece. When the Shimmerz Texturez paint was dried (thanks to my heat gun because I am super lazy and impatient), I have added some water over the top before adding various warm colored Shimmerz paints. I love the little Shimmerz paint pots they are such fun and gorgeous colors plus you get that amazing texture to boot. When the warm colored Shimmerz were dry (again using the heat tool), I have added some Turquoise Shimmerz as well. I have dried the warm colors before adding the Turquoise to avoid any muddy color mixing that occurs when mixing warm and cool colors together. Next up I have added some dribbles of Shimmerz Creameez in various colors to bring that paint color out to the kraft cardstock more as I knew my photo and embellishments would cover the majority of the textured background. Next up I have added some circles of dribbled Black Crackle Paint around where my photo was going to be mounted and then followed by some embossing using the Crafters Workshop Stencil Coptic Expressions and an Embossing Dauber with Ultra High Gold Embossing Powder. 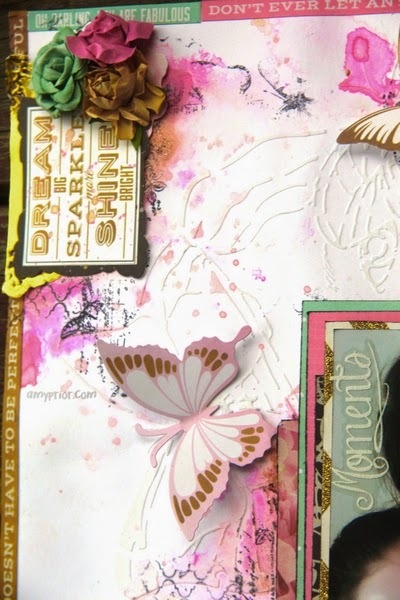 I just love the half cooked effect you can get with Ultra High Embossing Powder and it is so very simple. When heating the embossing powder and watching it melt, quickly stop melting as soon as you see it all bubble. This prevents the melted powder from melting completely so it leaves this cool textured effect. Normal embossing powder works the same way but the effect is much more noticeable on Ultra High. 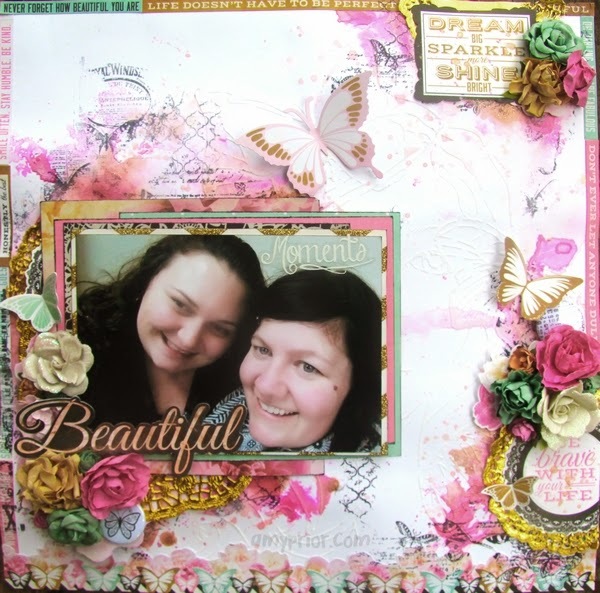 Next up today I have a pretty layout to share featuring myself and the gorgeous Jamie Dougherty in the picture. My background cardstock was white Bazzil Cardshoppe that I have simply added some White Gesso to through a Bloom Girl Stencil. Of course I had to use Jamie's stencils on a layout about her hehe. When the background white gesso was dried, I have added lots of water sprayed all over my background before adding Shimmerz Creameez using a paint brush splodging here there and everywhere. I have just used a couple of colors of the Creameez and let them blend as they liked but I have also added some Spiced Cider Shimmerz Blingz for some added texture and a different tone of color. The rest of this layout came together fairly easily. I have added some random stamping over the top of the Creameez using Archival Black Ink and some Kaisercraft Texture Stamps plus I have added some stickers from the collection of papers that I was using, around the edges of the paper to create a border of fab quotes. 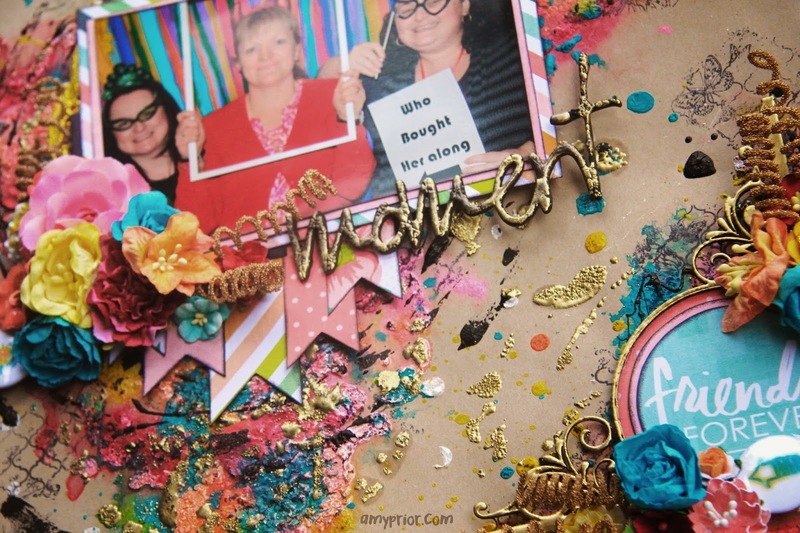 This paper collection also had lots of Ephemera so I have used one of the words for the title but I decided to add some Shimmerz Spiced Cider Blingz to the word to bring the shimmer to the forefront of the layout as well as the background. Shimmerz in Tickle-Me-Turquoise, Magenta, Sunny, Orange Sherbert & Royal Red colors. Thanks so much for stopping by and don't forget that you can purchase direct from Shimmerz Retail store here. Type my name "Amy Prior" into the comments to Merchant section when placing your order to receive a free gift. Until next time, happy scrapping!